Zoom is known for making audio recorders, but its latest product, the Q2HD, brings video to the recording party -- HD video, no less. Sure, there are many ways to shoot and share our lives these days, and it's a wonder that services like Ustream aren't just full of videos of people unboxing cameras, checking in and uploading pictures to Pinterest (while also watching Ustream). Zoom, however, evidently believes that though the method might evolve, the medium largely remains the same -- voice and video. As such, the Q2HD Handy Video Recorder (to give it its full name) promises to play, capture and stream, all in "HD audio and video." Paraphrasing of the box aside, we got our hands on one and took it for a spin. Want to know how it fared? Let's reset the levels, then head past the break for the mixdown. This isn't the first audio / video combo we've seen from Zoom, but where the Q3 dipped its toe in, the Q2HD dives in headfirst. Now, instead of two condenser microphones and VGA video, we're blessed with a mid-side microphone setup and full HD. As for the hardware itself, the mic arrangement means things can be neatly contained in one spherical shield, rather than two extremities on some stereo recorders. The rest of the device is a plastic, candy-bar-style affair with USB, HDMI and 3.5mm audio outputs on one side, with a gain control, delete button and full-sized SD card slot on the other. There's also a standard tripod mount on the bottom -- which will make getting the sweet spot that much easier. Around the front is a small LCD screen, four-directional navigation control with central button and two more, marked play and menu. That screen isn't just for viewing your video, it's also the main interface. The software is simple, and vaguely reminiscent of an older mobile phone. Here is where you can choose your video quality from 1080p, 720p and WVGA, with the last two offering 60fps in addition to the standard 30. Naturally, this is where you can jack up the audio resolution, too. You can start at AAC 64kbps through to 320kbps, or step things up a gear and go full PCM with the option for 44.1, 48, and 96kHz and bit depths of 16 or 24. Once you've finely tuned your settings (including the width of the stereo field) actually recording something is a breeze. One big red button sits between an empty SD card and a world of memories. It's worth noting at this point that the navigation buttons are a little light under your finger, and the fatter-thumbed can find themselves choosing the wrong option, like a last-second golf putting twitch. Of course, what you're really thinking is "Yadda yadda yadda, show us some video." Which is fair enough. We headed over to Antenna Studios in London where singer Breezy Lee was kind enough to let us shoot one of her recording sessions, ably assisted by James on guitar. We took two recordings, each from opposing sides of the room. You'll hear in the first half that the audio is fuller and clearer due to the positioning of Breezy and James' guitar. However, you may also hear some slight "clipping" when the vocal is strong. This is due to the high gain setting on the device. It's a good reminder that if there is going to be a large vocal / sonic range, the gain should be set low enough to allow headroom. While there's some visual noise to the video, the room was quite dimly lit, and these fixed-mode types of cameras -- like in a phone -- often give a "best effort", which the Zoom did admirably. We also thought it'd be interesting to test the Q2HD out in audio-only mode. For this, we set it up between two inward pointing monitors to create a triangle. Then we gently moved the Zoom around the stereo field. You can hear the result in the audio file below. 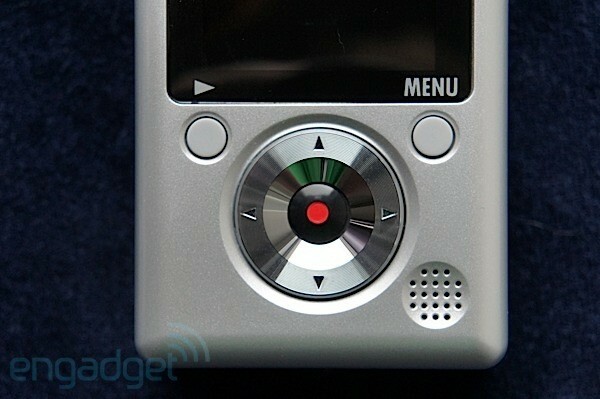 The final string in the Zoom Q2HD's bow, is that of audio / video streaming. It's not quite plug-and-play, as you'll have to head over to the product page to scoop up a driver, but once you do, you're pretty much set. We logged into Ustream and were presented with the Q2HD as a choice for our camera / microphone, and were streaming right away. It's at this point that you might be left wondering exactly who will profit from a device like this. Well, the audio credentials make it great for impromptu recordings, be it of a small band, interviews or field recordings. The video quality means the Q2HD will likely never be your main camera, but it adds useful extra functionality when you want more than just sound. And the streaming / webcam side of things could earn this a permanent place on your desk, between doing everything else we guess. So, it's not a jack-of-all type, rather a multitasking tradesman. This seems aimed at the audio engineer by day, that dabbles with video and likes to podcast on the weekend. Sound like you? Then count out $199 for when it lands at the end of this month. (Hauppauge, NY – July 09, 2012) Zoom takes the handheld camcorder to new levels with the release of their latest camera, the Q2HD. The Q2HD is massive improvement from its predecessor as it is the first handheld camcorder with both onboard Mid-Side stereo recording and live streaming capabilities when connected to a computer. In addition, the Q2HD features an upgraded camera sensor, enhanced user interface and much more for capturing and sharing great looking videos that sound better than ever. 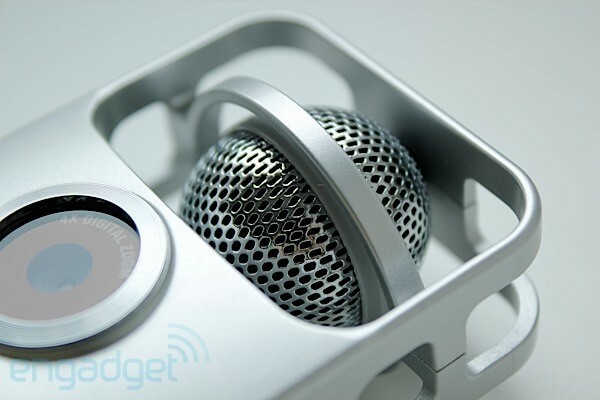 The Q2HD is also the world's first USB microphone with Mid-Side miking capabilities. All this at a brand new astonishing price point of $199.99 and hits stores this month. "With all of the upgrades Zoom made in designing the Q2HD, it makes it easy to record and share content in a wide variety of applications," says Mark Menghi, Director of Marketing for Samson Technologies, the U.S. Distributor for Zoom. "Whether you're using it for live musical performances, rehearsals and recitals to journalism, education, sports and travel, the Q2HD is perfect in any setting." The Q2HD is the first handheld camcorder to offer Mid-Side stereo recording. With its condenser microphones in 30° to 150° Mid-Side stereo configuration, the Q2HD gives you natural depth and accurate imaging. Select 1080p or 720p for amazing clarity and detail no matter where or what you're shooting. With a new lens and imaging sensor, the Q2HD captures exceptionally clean video that is compressed with the industry standard H.264 video codec. Now, you can stream your videos through your computer directly to the web with the Q2HD. This is another first for Zoom. Simply connect the unit to your computer via USB cable and start streaming like the pros. The Q2HD's streaming function is compatible with Ustream Producer, Flash Media Live Encoder, Skype and other top streaming applications. It's never been easier to broadcast your movies on the web in real-time. The Q2HD is packaged with everything you need to make your movies right out of the box. It comes with a 2GB SD card for up to 40 minutes of HD video, HandyShare editing software and two AA batteries.